A "spider-proof" shed has gone on sale for almost £2,000, but can technology really keep the creatures out, asks Justin Parkinson. It's peak time for spider sightings in the UK. As early autumn comes, males are seen scuttling around houses and gardens looking for food and a mate. They're not interested in humans, but arachnophobia is still one of the most common fears. There are dozens of products aimed at ridding people's lives of spiders. Sprays compete with electromagnetic traps, lavender-filled bags and specially designed vacuum cleaners. 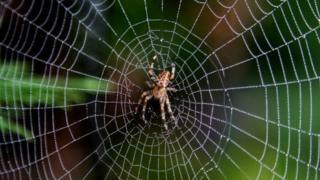 A phone app has been launched to combat arachnophobia, showing users pictures of spiders every day to desensitise them. Advice offered includes placing conkers in the house, the theory being that spiders and other creepy-crawlies are scared of them. But research by Nottingham University's school of life sciences found the opposite was the case - that spiders actually quite liked them, favouring them as something to hide behind. Now a company has promised to make garden sheds "spider-proof". Tiger Sheds says its model - at £1,999, several times the price of a basic shed - is air-tight and lined with repellent paper. It's even painted blue, a colour the firm argues is "proven to repel spiders". Buyers can upgrade to have the wood impregnated with deterrents such as peppermint, citrus and insecticide and to set up a "creepy-crawly den" nearby, offering would-be entrants a more appealing alternative. Tiger says all this will allow the fearful to "enjoy their garden sheds once more". But the Nottingham University's Sara Goodacre, who has studied the behaviour of spiders, is sceptical of the idea of proofing a shed, or any other premises, against them, as they are so prolific. And guarding a shed from spiders doesn't alter the fact they they will still be in the garden itself, she adds. Insecticide sprays are "incredibly good at killing spiders", Goodacre argues, but it's probably more humane to trap and release them if they're found in a shed or a home. Arachnophobia is largely a "learned" behaviour, she says, and can be dealt with psychologically. "My best advice is, when you see a spider in your home, or shed, give it a name," says Goodacre. "When we find one at home, we always call it Christopher. It changes the way you view it. Spiders get a little bit less scary if they have a name."